Crank takes as its basis and inspiration the raw, erratic, unstable, wonderful sound of the hurdy-gurdy - an Eastern European folk instrument built around a resonant soundbox, five or more violin-style strings, a wooden peg keyboard, and (most importantly of all) a rotating, hand-cranked wooden wheel. This wheel is rosined (like a violin bow) and scrapes across the strings to produce the hurdy-gurdy's tone. It's an absolutely magical instrument, steeped in tradition, and uniquely evocative of gypsy campfires in dark forests. But we've brought it out of the forest and into the laboratory, and the result is a hand-welded hybrid instrument that fuses the hurdy-gurdy's buzzing, catgut tonality with the synthesiser controls and analogue waveforms needed to sculpt it into textural soundscapes, swirling swells, hypnotic pads and all manner of acoustic-flavoured strangeness. This is the hurdy-gurdy reborn as synth. On the left of the panel is one pairing of Crank waveform and analogue Oscillator; on the right, another, almost identical one. (There are two small differences between them: they employ different styles of low-pass filter - one Moog-style, one Prophet-style - and the Noise waveform for Osc A is standard white noise, whereas for Osc B it's a vinyl crackling instead. We just like to mix things up.) The Crank waveform can be multiplied via the Multi control, giving you instant density and depth with precise control over detuning... although the Crank waveforms themselves are pretty erratic, so they'll be naturally detuned in any case. The analogue Oscillator offers some more familiar waves to complement the acoustic nature of the Crank: you get typical Triangle, Sawtooth and Square wave, plus a Sine pitched one octave below the Crank for a nice bit of sub-boost. The twin Noise waves live here too, and can really add some old-fashioned grit to the sound. High- or Low-pass Filter and LFO controls round out the feature set for each bank, and of course the banks can be individually tuned (say, to octaves, or fifths) for even more versatility. The Glitch button lives front and centre, and musically randomises the whole instrument to produce new patches for you with just a single mouse-click: great for some instant inspiration! Round the back, meanwhile, is an effects panel with Chorus, Phaser, Delay, Rotary speaker and Amp Cab. The first four effects are patched as sends rather than inserts, so you can choose exactly how much of the effect you want added - great for adding a background hint of Leslie swirl to a patch without completely Hammonding it up! Crank is designed to take your sounds in a new, unusual direction - bringing a hefty dose of instability and air to a synth framework. 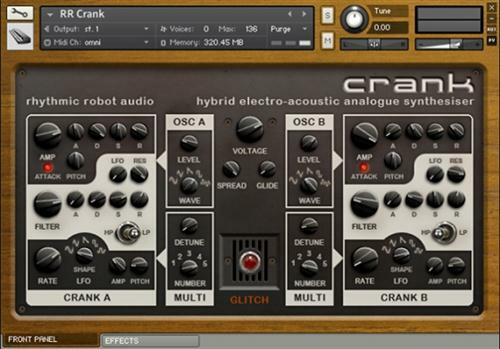 Whether you use it to create one-of-a-kind acoustic machines from an alternative reality, or just to add some �?real' mojo to a classic synth patch, the unique sound of Crank brings its little bit of gypsy magic to the party. Rhythmic Robot Audio Crank KONTAKT download links are externally hosted on Extabit, Rapidshare, Rapidgator, Netload, Uploaded and Rhythmic Robot Audio Crank KONTAKT also available directly on Torrent Sources.